Ashraf Al Shafaki is a Design Thinking Trainer and Consultant. He has a deep interest in sustainable projects. Get out a piece of paper. Brainstorm topics for a training course. After a 5 minute brainstorming session, start crossing out topics you find less favorable such as ones you find unpractical, of low demand or those you find you are not very capable of delivering. This step would be even better of you do it together with someone else. He or she can provide you with an additional perspective in which topics can be of interest. After narrowing down the brainstormed topics to a list of 2 or 3 topics, select one of them to design a training course around. Information: List essential pieces of information that you would like participants to learn. Skills: List the various skills you would like participants to gain or improve. Behavior/Beliefs: List the behaviors you would like to change in participants and which beliefs you would attempt to change in order for such behavioral patterns to change. For more information on coming up with training objectives check out Developing Training Objectives. When setting training objectives, make sure also to keep in mind The 3 Core Objectives of Training. If you are designing a training course for a specific corporate client you may also like to learn how to uncover training needs. After writing down a list of training objectives, be they informational, skills based or a set of behavioral changes you would like to make in participants, now you would have to decide on how to accomplish each of those objectives through the training. 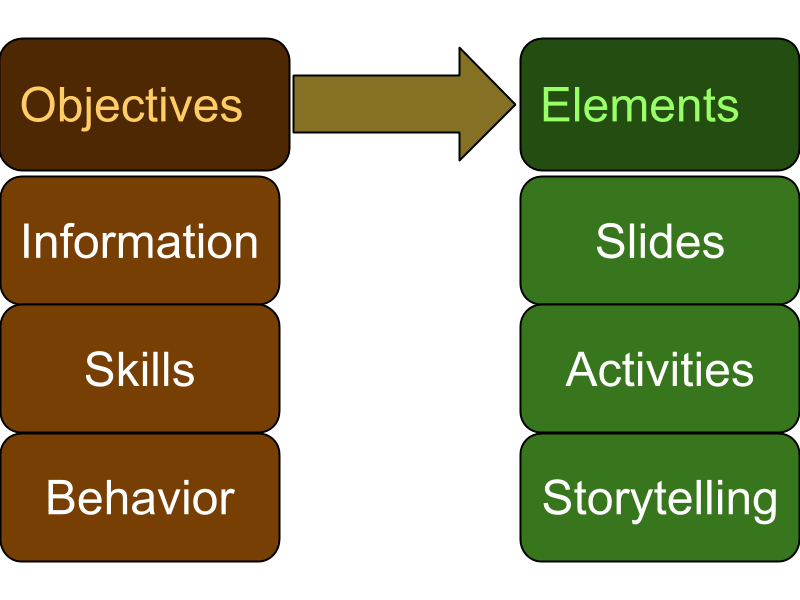 Information objectives can be achieved through storytelling, slides, direct instruction, as well as group activities. Skills based objectives can usually best be achieved by solo exercises, pair work and group activities. As for behavior changes, they can be made by changing participant beliefs through storytelling, reflection, showing a video as well as group activities. For each training objective, it is a good idea to list one or more elements to accomplish it. It is also worth mentioning that every training element (video, group activities, storytelling …) may have more than one function at the same time and help achieve more than one training objective simultaneously. By deciding on a training topic for your training course, setting objectives that cover the 3 categories of information, skills and behavior related to the topic of your training course then deciding on one or more training elements to achieve each of those training objectives you have listed, you now have a training program designed to achieve specific results. Make sure you also achieve The 3 Core Objectives of Training through icebreakers, recap, breaks and other activities. After completing the design of a training course with all its objectives and training elements, give the training course a spin by actually delivering it and getting feedback from participants. The feedback and your own reflection on the training course after delivering it will help you further hone the training program by adding new elements, removing other elements and modifying yet others. The loop keeps repeating as you go ahead in deliver your training course and rising in a continuous upward spiral towards a better designed training program that has real impact on participants and is fun to attend at the same time.